She's Fantastic: Wild Republic's SISTERS OF THE SEA! This redheaded mermaid with a green tail and blue shells comes with a large sea turtle. She has four points of articulation: Arms, Head, and Tail. I'm aware of three color variations in the Sisters of the Sea line. The most popular one seems to be the redhead with purple shells. 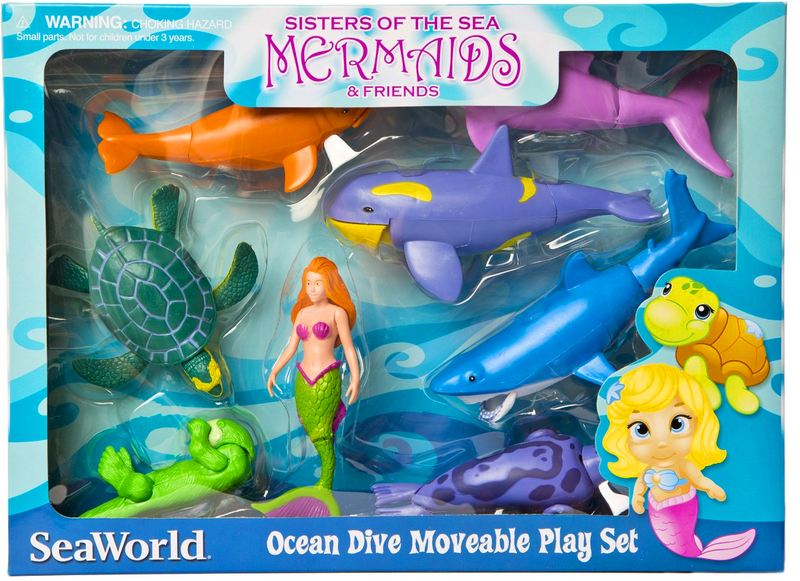 She comes in a large playset with seven ocean animals. This is the set that you can find on Amazon and eBay with no problem. Here is the actual figure I saw in the shop. I took a photo so I could Google the toy line later. I quickly found out that online information is practically nonexistent. 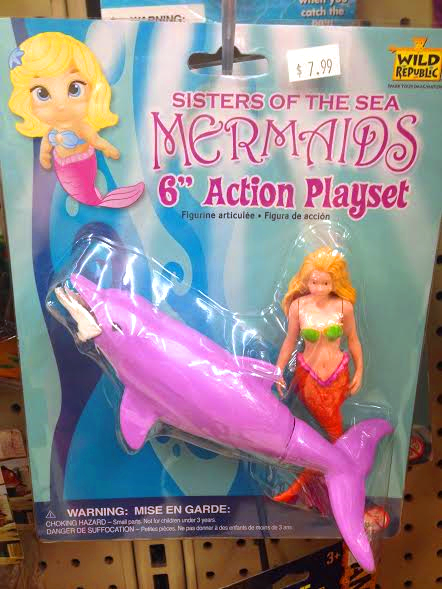 The blonde figures come with a pink dolphin. Here is a screenshot of the 2014 Wild Republic catalog. Goodness, this one is too much!! So atrocious!! but thanx for review. Puts a smile on mah face. I only discovered Wild Republic today and I actually like these mermaids. 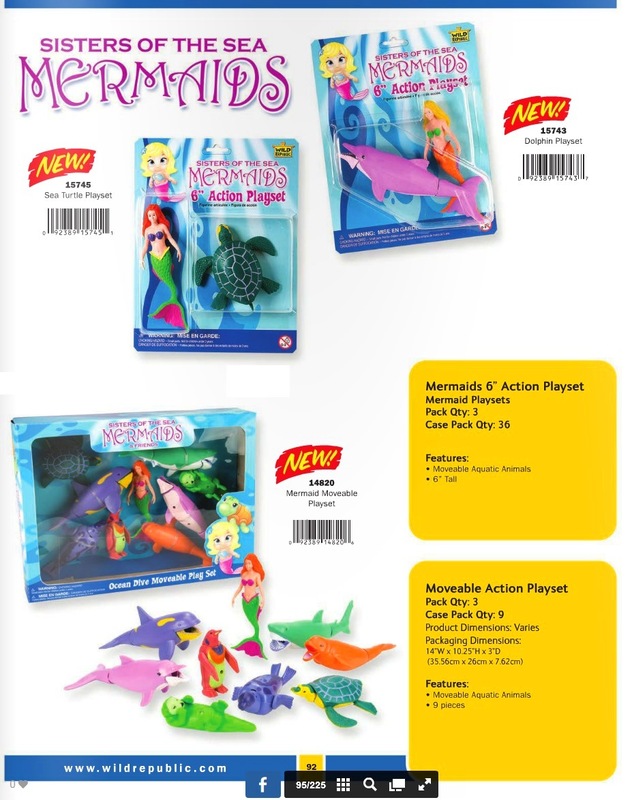 The reason I like them is the articulation and the fact that they are a generic mermaid, not girly girly, not Disney-fied, not cartoon-ified or anything else. Just a basic mermaid, so I've decided to give them ago and have sought out a couple of them on eBay. I do kind of feel that the fin tails, seashells and hair colour are unfortunately either inspired by or based upon Ariel from the Disney Little Mermaid, but that aside, I'm looking forward to seeing them in the flesh.